Though "The Score" fits firmly in the 'heist gone awry' mode, it fortunately avoids the mistakes of other recent entries of the genre, such as "3000 Miles to Graceland" or "Reindeer Games", which combined dumb action with even dumber plot mechanics. Instead, this sharp and intelligent thriller from former comedy director Frank Oz ("Bowfinger") benefits from a clever script that subtly ratchets up the tension and the audience's involvement with its characters over the course of two hours. Furthermore, "The Score" scores big with a casting coup that features three iconic actors representing three generations of Hollywood stardom: veteran Marlon Brando (whose 50-year long acting career started with "A Streetcar Named Desire"), the infinitely-watchable Robert De Niro (seen recently in "15 Minutes"), and rising star Edward Norton ("Fight Club"). De Niro plays Nick, a professional safecracker and thief, who is called upon by his long-time business associate Max (Brando) to do the proverbial last hatchet job. The object in question is a priceless gold scepter that is being impounded in the heavily-guarded Montreal Customs House. Fortunately, Max has a man on the inside named Jack (Norton) who has infiltrated the Customs House as a retarded janitor and can disable most of the building's security systems. For his trouble, Nick will earn a cool $4 million, which will not only help him pay off the heavy mortgage on the jazz club he runs, but also allow him to put behind his shady past and settle down with his girlfriend Diane (Angela Bassett of "Music of the Heart"). Of course, like all 'heist gone awry' movies, things don't always turn out the way the characters plan. As the film unspools over two hours, unexpected complications and fresh revelations make completing the heist more difficult and more dangerous for Nick. Unfortunately, though he initially took the job under the assumption that he would walk away at the first sign of trouble, he finds that the circumstances make it increasingly impossible to do so and he has little choice but to see it through to the bitter end. In comedy, timing is everything, which is a lesson that director Frank Oz puts to good use in the economical and no-nonsense procedural of "The Score", which is most evident in the film's crackerjack last act detailing Nick and Jack's carefully-planned heist and some heart-stopping unexpected twists. Even the film's earlier and less-action-oriented dialogue-driven scenes are engaging with the top-notch performances by the talented triumvirate of headline actors. Most notable is the chemistry between De Niro and Brando, which goes a long way in establishing Nick's motivation for going through with the job, despite the odds against him. 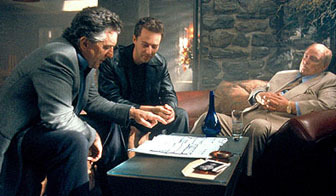 Norton also delivers an impressive turn as the cocky but capable younger thief, while Bassett makes good use of her limited screen time as De Niro's love interest. "The Score" may not have the spectacle of its bigger-budgeted blockbuster brethren at the local megaplex, but it certainly scores with its sharp writing, taut direction, and a 'dream team' of talented actors. For one of the most absorbing and well-made caper flicks in years, score yourself some tickets to this top-notch thriller. 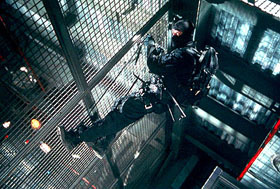 Images courtesy of Paramount Pictures. All rights reserved.